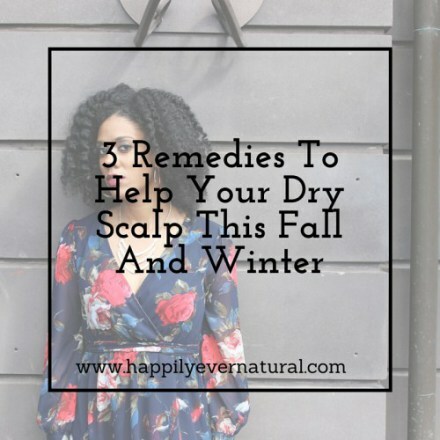 Now that Fall is upon us and winter is approaching, I have began to notice my scalp becoming dry because of the cold weather. I have always dealt with dry scalp issues, even while I was relaxed. I want to focus on the health of my hair and scalp so I look for healthy, natural ways to help combat the issues I have with my hair. So far, I have found three, effective ways that have helped me combat my dry and itchy scalp. It moisturizes your hair and scalp. It is one of the best solutions for dry and itchy scalp. It is important to note that you must always dilute the tea tree oil before applying it to your scalp! Apple Cider Vinegar (ACV) is a great natural way to relieve dandruff, dry scalp, and buildup in your hair as well. Apple Cider Vinegar contains enzymes and properties that act as a fungicide and cleanser at the same time. The acidity of Apple Cider Vinegar changes the pH of your scalp in turn killing off the fungus that causes icky dandruff, dry and itchy scalp. When I start to notice massive amounts of dandruff, I like to treat my hair with an Apple Cider Vinegar rinse. I mix a half a cup of apple cider vinegar with a half a cup of water. I usually just put it in a spray bottle and spray all over my hair and scalp. Make sure to dilute with equal water to ACV, it’s very acidic. I use a shower cap, leave it on for from 15 to 30 minutes and then wash it out. This technique usually combats my dandruff well. Cues music….” I’m in love with the coco” “I use that on everything” Ok I’m done! I really do use coconut oil for everything, though! Coconut oil is one of the most used oils and it also serves as a remedy for dry scalp. It helps to restore moisture to the scalp and helps prevent your hair from becoming dry and flaky. I usually massage the oil on my scalp, leave it on for 30- 45 minutes, and then rinse (Pre-Poo). What will you be using on your scalp during the colder months to help combat dryness?